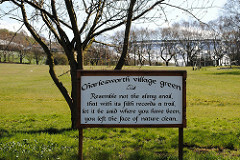 The main open space in Charlesworth Parish for the community is the Village Green on Marple Road, this is maintained by the Parish Council. This popular park and playground can be accessed from Marple Road in Charlesworth. It has a field with football goal posts, a small children's playground with various activities, swings and zipwire. It is a favourite with families and dog walkers. Can all dog walkers please ensure they use the bins provided for waste.